When the groom was a graduate student at Florida A&M University, he served as a Graduate Assistant for Dr. Larry Rivers, the Dean of the College of Arts and Sciences. The bride worked as a work-study student for Dr. Ralph Turner, the Assistant Dean of the College. The couple met while both worked in that office and they began dating shortly after the groom earned his master's degree. The bride is extremely competitive! While she may not outwardly show that she is competing, she is always locked in during game nights with friends. If she and her groom win, then she talks more junk than him (and anyone who knows the groom knows that is hard to believe). On November 28, 2017, the couple had their first child, a beautiful baby girl. They collectively agreed on their daughter's name months before she was born. The bride's grandmother's name is Eva Mae Nelson. The groom's mother's name is Erma Jean Ellis (EJE). In honor of these two strong women, the bride and groom named their daughter Eva Janelle Ellis, Eva after the bride's grandmother and the initials EJE after the groom's mother. The groom is a member of Alpha Phi Alpha Fraternity, Incorporated and his line brother officiated the wedding. The couple met in 1995 when the bride worked at McDonald's. She spotted the groom out a mile away. After a brief courtship via phone, they disconnected, but luckily, the groom found her again months later by going to her job. Although the bride was hesitant at first, she gave him her number (again) and the rest is history. After dating for four years, the groom proposed at the bride's job. He made sure that the bride's mother and grandmother were there to witness the proposal. The couple has yet to go on a honeymoon but everyday of their marriage has been an adventure. They will celebrate 20 years of marriage in four months and are so grateful and thankful to God. The bride graduated from Stanford University and received a doctorate in international relations from Oxford University where she was a Rhodes Scholar. The bride met her groom at Stanford University during her freshman orientation. He was a senior. Their wedding was covered in the New York Times. Officiant: Rev. Adam Clayton Powell, Jr. The bride wore a $700 ice-blue satin gown created by black designer Zelda Wynn Valdez. 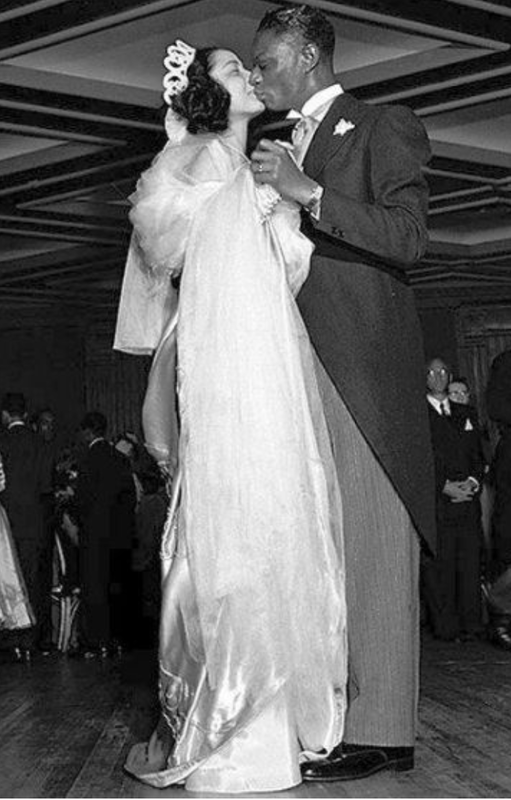 The dress was long-sleeved ending in points over her hands and featured a white beaded shawl collar. The ceremony was billed Harlem's biggest wedding in 25 years and cost $17,000. 3,000 guests attended the event. Thousands more lined the streets outside of the church. The couple hoped to have their wedding reception at the Waldorf Astoria but the hotel refused their patronage because they were black. They had the reception at the Belmont Plaza. Guests dined on turkey, ham, and rib roast. The bride and groom had a 5-tiered wedding cake. The couple honeymooned in Mexico City and Acapulco. The bride wore a winter white dress decorated with sequined butterflies. The groom wore his U.S. Coast Guard uniform for the wedding ceremony. Both the bride and groom were born on the same day, January 9. The bride's twin sister served as her maid of honor and only attendant. The couple met as teenagers in Prince Edwards Coounty, MD. The couple's anniversary is also the bride's birthday. Their first date was via telephone when the bride was 14 and the groom was 15. The couple almost called off their wedding ceremony because they had a fight hte day before the wedding. They changed their minds and took their vows in front of 800 guests. The couple's son served as the ring bearer. The couple divorced in 1990. The bride and groom met in May 1985 while both were on vacation with their kids in the Bahamas. The couple held a civil ceremony on October 23, 1985 in New York City but opted for a fairy-tale wedding in Europe. The church where the wedding was held is the oldest church in Switzerland. The bride wore a pearl-embroidered, white satin dress. Her Belgian lace train cost $12,000. Stevie Wonder performed for wedding guests. The happy couple honeymooned on the groom's private 370-acre Pacific island. The couple met in 1997 when the groom's band, Mint Condition, backed the bride on a nationwide tour. The bride wore an ivory duchess satin gown by Vera Wang that had spaghetti straps and a hand-beaded notched bodice. Security was very tight for the ceremony. The invitations directed guest to a local church; when they arrived, they needed a ticket to get on shuttles that took them to the private estate for the event. The groom and his groomsmen entered to the song "So Fresh, So Clean." A 16-piece orchestra played for the bridal party's entrance. The bride changed into a white satin one-shoulder dress for the reception. The couple had a Tiffany-themed, 3-tier wedding cake. The Governor of Georgia, the mayor of Atlanta, and entertainment royalty attended the ceremony. The bride's wedding dress had been her Halloween costume the year before. The groom first spotted his bride in 1980 at the U.S. Olympic trials but they did not begin dating until 1986 when the bride began training with coach Bob Kersee who would later marry the groom's sister. The couple's special number was 7. The groom proposed on 7-17-87 at 7 pm. The couple set a wedding date for late 1988 after the Olympics but a 5.9 magnitude Los Angeles earthquake on October 1, 1987 made the bride want to get married as soon as possible. They married nine days later with an impromptu Vegas wedding. Their favorite song throughout their courtship and marriage was "All My Life" by K-Ci and JoJo. The bride died unexpectedly in 1998 and the groom had the song played at her funeral. The bride and groom met and fell in love when they played lovers on the television series "Soul Food." The wedding was held in a 900-year old church were the groom's parents had married years earlier. The couple's wedding occurred a few months after the birth of their first child, a daughter named Sophie. Couple: Rhonda Bryant and Ricky McFarland, Jr. The bride and groom grew up in the same church and lived in the same town. The bride used to volunteer to stand on the back row while cheering at Clayton High School football games so that she could be closer to the football team. The groom was on the football team and he used to purposefully run the bride’s way to get tackled next to her. Before they were married, the bride and groom used to be the last people to approach the altar for prayer during weekly church services so that they could hold each other's hand during prayer at church. Both of them had sweaty palms. The couple was blessed with beautiful girls in 2006 and 2010. God blessed them with a little boy (rainbow baby) in 2017 and they had the gender reveal in the midst of Hurricane Matthew on their anniversary in 2016. *A rainbow baby "is a baby born after miscarriage, stillborn, or neonatal death...The child is called a rainbow baby because it is like a rainbow after a storm: something beautiful after something scary and dark." The couple began dating in the late 1970s when they were both freshmen at Michigan State University. The groom called off the engagement TWICE. The couple planned a private wedding ceremony but 3,000 fans stood outside of the church cheering. Wedding guests included basketball stars Isiah Thomas and Mark Aguirre. The bride wore an ivory satin gown fashioned with a long bodice. The neckline was embroidered with seed pearls and rhinestones. Her only jewelry was a strand of pearls given to her by the groom. The bride graduated from Spelman College in June 1941 and was a student at Julliard School of Music at the time of the wedding. The groom graduated from Morehouse College and Atlanta University. 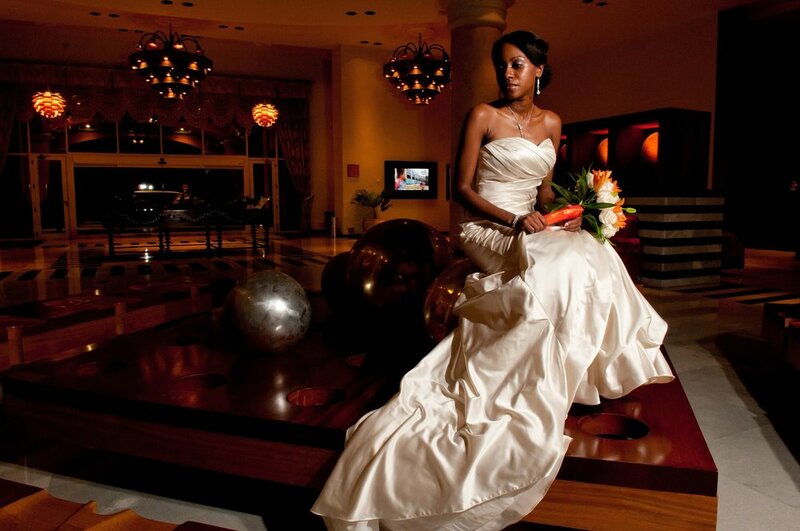 The bride was the daughter of Atlanta University President Rufus Clement. Songstress Anita Baker introduced the couple. They dated for three years before marrying. The bride wore an ivory satin gown created by Vera Wang. It poured rain the night before the couple's outdoor wedding. The bride and groom honeymooned in Bali, Indonesia. Couple: Erin Woodom and Meredith (Cole) Coleman, Jr. Both the bride and groom attended Winston-Salem State University at the same time and had several mutual friends but did not know each other. They met one year after the bride graduated though some of their mutual friends. The bride was living in North Carolina at the time and the groom was living in New Jersey. The groom was born on the 8th of September and the bride was born on the 8th of December. They got married on the 8th of October (Beyonce and Jay-Z inspired, of course). The couple had a destination wedding with almost 50 of their closest family and friends there to celebrate with them. The wedding invitations were made to resemble airline tickets and all of the invitations were handmade by the bride with a little help from her mother and godmother. The couple got married on the beach and it rained up until it was time for the ceremony. In some cultures, rain before the wedding is seen as good luck---a cleansing or the washing away of the old for a new beginning. The bride's best friend, Crystal, is the groom's cousin. 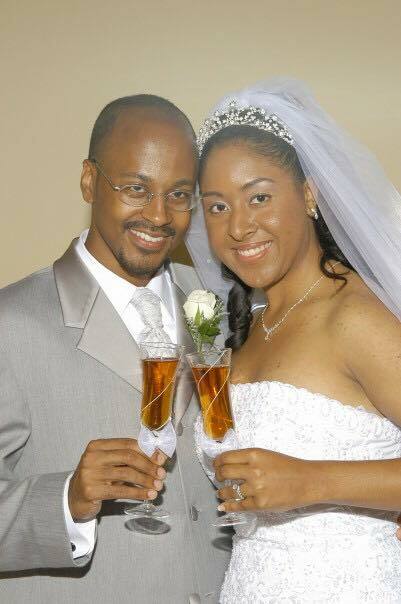 Although the groom and Crystal grew up together and the bride and Crystal have been friends since 1994, the couple did not connect until 2016. After 10 months of dating, the groom proposed to the bride at a concert in Raleigh. He got permission from security and proposed right in front of the stage, while Maxwell sang the bride's favorite song by him--This Woman's Work! The bride and groom are expecting a baby in March 2019! The couple met on Blackplanet.com in January 2003. They were both seniors in college--the bride at UNC-Chapel Hill and the groom at North Carolina Central University. The groom sent the bride an online message and she responded. The couple began communicating on Instant Messenger but the groom distanced himself a bit when he thought the bride was in Charlotte rather than Chapel Hill since she used the words UNC-CH in an online chat and he mistakenly thought that meant UNC-Charlotte. When the bride mentioned hanging out with friends on Franklin Street, the groom realized that a long distance relationship was not necessary. When the couple finally spoke via phone they talked until 3 am on the first night and talked daily for about a week until they decided to meet in person. Their first date was at Miami Subs on Franklin Street. What drew the couple to one another was their shared love of music and their faith. The groom attended NCCU as a Teaching Fellow music education major. The bride was a music double major at UNC. After dating for 2 years and being engaged for 1 year, the couple married. The couple chose to have their wedding ceremony at 10 AM so that they were able to enjoy the entire day as a newly married couple instead of being exhausted after a late-afternoon or evening wedding. The couple had their wedding reception at the Regency Room, an event venue in downtown Greensboro. They were the first people to hold an event at the center. The wedding was held the day after the bride's birthday. The bride wore a mermaid-style satin gown Dennis Basso gown with a halter neckline that tied into a bow. The wedding had 150 guests, including Tina Knowles-Lawson and Phaedra Parks. The couple began dating in 2016 and got engaged in 2017. A mutual friend introduced the couple. The bride wore a custom Vera Wang gown and Christian Louboutin sandals. The bride's best friend, Eudoxie Bridges, served as one of the matrons of honor. She is also the wife of rapper Ludacris. The singer Tank sang "At Last" as the bride walked down the aisle. The couple just celebrated 10 years of marriage in August 2018 and they have 3 beautiful boys. The couple met by happenstance in 2006 at the bride's family's Thanksgiving meal. She was supposed to spend the holiday elsewhere but her plans fell through. The bride's cousin invited the groom to the family gathering because the groom's parents were out of town. At the time that the couple met, the bride was living in Memphis and the groom was in the Army so their first date was not until the following Thanksgiving. They went on an outing with the bride's cousins after the Thanksgiving meal. The groom's father is the pastor of Bannister Road Bapist Church in Kansas City, MO. The groom proposed to his bride during the church's 25th anniversary banquet. The groom arranged for his family and the bride's family to be in attendance at the church banquet for the proposal. The groom and his 5 brothers used to sing as a quintet with their mother as the accompanist. During the church banquet, they pretended to sing a song with the groom as soloist. They began to sing and the groom did a "Temptations" slide out, got down on one knee, and proposed. The bride was completely surprised but she said yes!!! Everything about the bride's "wedding look" was done by the women closest to her. The bride's mom made her wedding dress. The bride's mother-in-love made all of her jewelry, and the bride's sister did her hair and makeup.